Some deals are nice, some are great, and some like this one can be a little too good. Remember that promotion Google Express had with Walmart, where if you buy a Google Home or Home Mini through the retailer you can get $25 off your next purchase on Walmart via Google Express? Well, that promo is still live and works with the already discounted $29 Home Mini and $79 Home. You'll have to pay the full $29/$79 first, sure, but the deal is fantastic on the Home Mini. You're essentially getting it for $4. Even with Artem's misadventure causing Google to gimp some of the Mini's functionality, this can be a nice desk smart speaker, a great kitchen timer, easily the most convenient tool to find your phone around the house, and an additional voice controller for your smart home. Not to mention everything else you can do with it. 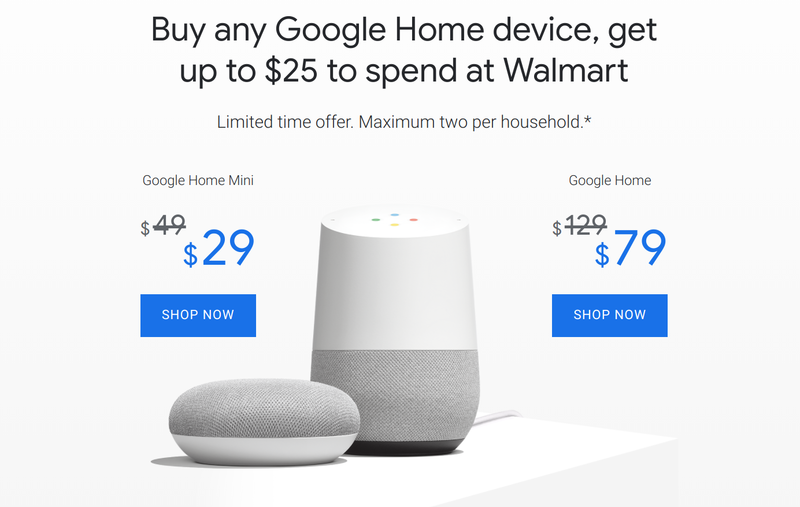 Here's how you take advantage of the deal: you first buy a Google Home or Home Mini for their discounted $79 and $29 prices, respectively, at Walmart, Walmart.com, or on the Walmart store on Google Express. You activate your Home/Home Mini before January 15, 2018, and in the Home app, you link your Walmart account if you haven't done so already. Then you shop on the Walmart store on Google Express and you'll have a $25 promo code waiting for you at checkout. You'll need to use it before January 31, 2018.